We are well into the new year. If you have passed Grade 12, this is the beginning of your career. You will be starting a new life at a tertiary institution of your choice or you will be starting a new job. Now that you are on your own and have an income, you might be tempted to spend it on all the things your parents would not let you have before. Go slow. If you plan and save you can avoid getting into unnecessary debt. Saving will help you achieve your dreams. Whether your dreams are big or small it is important that you save for them. When saving you need to have short-term and long-term goals. For example, you can start saving for short term goals like buying a dress or a watch you always wanted, or you can save for long-term goals like buying text books for the next year of study. It will be helpful to write down your long term and short-term goals. When starting to save it is important that you work out a personal budget. This will help you know where every cent goes, which, in turn, will help you manage your income better. Within your personal budget you must put aside an exact amount that you need to save and make sure that you don't use it for any other expenses. Revise your budget regularly and keep your eye on the future. 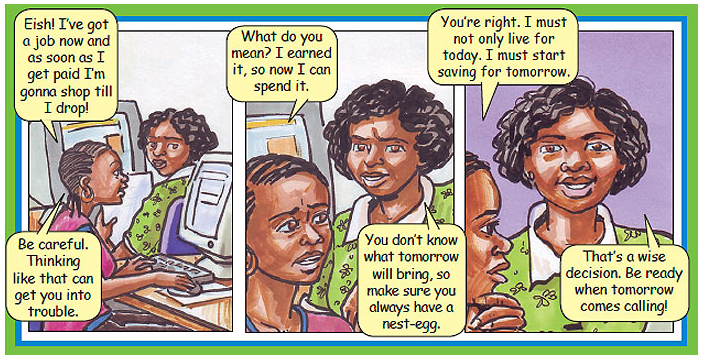 When saving, it is important to know why you are saving. This will help you decide on the amount of money that you need to put aside every week or month. It will also be best to decide where to save your money to get the best returns. You may have to use different savings products to help you meet your different goals. Find out about savings plans from your bank. Remember, to reach your goals you must stick to your savings plan. Make saving a habit in your life. It will make it easier if you discuss your savings plan with your parent or close friends. The more you talk about it the more you can commit to it.